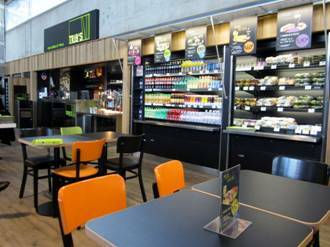 Montpellier airport launches new catering outlet. Bright and inviting - the new Trib's outlet lifts the departure lounge. Comfortable chairs and sensible sized tables, with fresh, simple and quality food should be a hit with passengers and "collectors" alike. Plat du jour at 14.90€. If the food given to the Press at the opening is anything to go by the offerings will be delicious. Black and stainless steel for the professional look of the servery. Delays expected to flights in and out of France. Please Check with your airline before starting your journey. Ryanair, confirmed that it has received regulatory approval to operate a series of 100 trial flights in Apr & May during which 5 rows of seats will be removed to allow up to 50 passengers to stand for the duration of the 1 hour flights at fares of just £2 for each standing passenger. Ryanair will now remove the last five rows of seats from 2 of its 25 Stansted based aircraft in order to offer 50 standing only fares on a series of 100 test flights over the next 2 months to/from Stansted. If this series of 100 proving flights with a standing only area is successful then Ryanair will seek regulatory approval to extend this standing only cabin area (and these £2 standing fares) to all of Ryanair’s 300 aircraft fleet. Ryanair’s £2 standing only fares go on sale today 2 Apr 2012 on www.ryanair.com. Thanks as always to Robin at WoW for this update.